THE MANTLE OF POWER | Watchman - Declare What You See! According to the article, it seems that the Republicans only claim to a “mantle of power” is found in either Ronald Reagan or Jesus Christ! As the title implies, Ronald Reagan is the SuperStar of the Conservative Right along with Jesus! As we proceed in this article, I believe that you will be amazed, shocked, and disturbed at what will be revealed in light of the overall project – The Lucifer Project – Raising Antichrist. Please be patient as you read, and don’t skip ahead in this article in order to grasp the discernment needed to fully understand the meaning of the information that’s going to be disclosed. While I’m not taking “sides” in the Democrat vs Republican or Left vs Right arguments in this article, if my only choice were between the two it would certainly be with the Conservative Right viewpoint. That being said, neither choice will provide “salvation” for any of us, either physically or spiritually, in the coming days we are now facing. Christians are to be involved primarily in “building the Kingdom of Christ”, not the kingdoms of men on earth! Here’s one website from the “Right” called The Patriot Post . Can this be tied to the spirit of the “Right” in any way other than the name? This is a project with the goal of “HONORING THE 20TH CENTURY’S GREATEST PRESIDENT WITH A MEMORIAL IN EVERY COUNTY IN AMERICA”! Take a look at the map for locations where a memorial has already been placed showing the county and State. This project is no small undertaking! The assassination attempt on Ronald Reagan was on March 3oth, 1981. That brings the numbers of 33 and 330 (3/30/81) into play once again. While the number 33 and its meaning should be evident by now if you have read all the previous articles, the number 330 requires a little more discussion. The number 33 is found within the number 330. However, the zero is important it this equation because of what it implies. 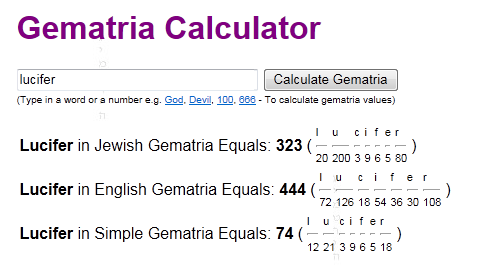 The number, 330, is the numerical value of Satan in the Sumerian Code (English Gematria), and “zero” is representative of “eternal life” to the Luciferian. Satan is one of the entities that will incarnate “the hidden one” – the Beast – as he becomes Lucifer/Anti-Christ. The total of the numbers involved in the date above reveal the following. Reagan was certainly Mr. 33 in many ways as we have seen previously, and we have looked at the possible incarnation of a “clone” (temple of flesh) by the “Spirit of Reagan” and Satan at which time the Son of Perdition would then become a reality! O. K., let’s add up the above date as the Luciferians/Occultists would in their dark world of hidden meanings. We have the numbers 33, 330, and 81 in the date of the assassination attempt, and 33 + 330 + 81 = 444! This is the exact number in the Sumerian Code associated with LUCIFER! The claim of REAGAN2020.US as the most comprehensive resource on the Internet is a bold claim indeed, since the WWW is full of all things Reagan! Does the numerical value of the very name of this Reagan web site itself reveal anything of significance? The number 1800 reveals the number 6 + 6 + 6 = 18, and the double zeros could be considered as the other two parts making up the unholy trinity of the coming Beast – Antichrist/Lucifer. Also, the number 9 ( 8 + 1), as in the year of the assassination attempt, is the number associated with PERFECTION by the Luciferians! What about the number of 1110 associated with the NEW WORLD ORDER? Can it be found in the assassination attempt in some way? Yes it can! Referring back to the very first article in this series, you’ll recall that 666 + 444 = 1110, and all three numbers are associated with the life of Ronald Wilson Reagan! Who was the man who attempted to assassinate Reagan? The “stamp” of the NWO under Antichrist appears once again. You might also notice that the number, 111, appears in many “Simple Gematria” calculations that reveal the number 666! This is 1110 without the zero being present. Satan himself will complete the total picture of the NWO as the created “eternal being”, as zero implied eternity to the Luciferians. Two of the most recognizable supporters of the American Tea Party Movement are Sara Palin and Newt Gingrich. Both have voiced their support of the American Tea Party Movement at various rallies; and they currently appear to be the two front-runners in the Republican race for U. S. President in 2012. Can the “Spirit of 1776” be found within this organization? 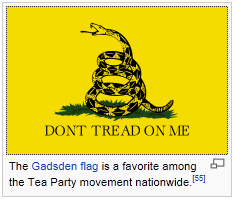 While there are other countries involved in a Tea Party Movement of some sort, I find it spiritually relevant that the numerical value of Americans Tea Party Movement has the numerical value of 1776, a number made up of the numbers 1110 and 666! Refer to the Part I of The Lucifer Project – Raising Antichrist for a full explanation of 1776. The year, 1860, brought forth the election of Abraham Lincoln to the office of President of the United States. Lincoln presided over the American Civil War during his term; and he, like Reagan, was the victim of an assassination attempt, only the one on Lincoln succeeded in the pattern of the Zero Year Mystery involving U. S. Presidents. Today we find ourselves on the verge of another “Civil War” in America or worse, and The American Tea Party Movement appears to be on the “leading edge” of this reality. Has the “Spirit of Revolution” come full circle in our day? Once again, I compared the Time-Wave Calculation charts to see if the pattern of the American Civil War might be repeated in some future manner that would be indicated by the charts – only with a steep acceleration and taking place in a shorter time frame. This does not mean that the next American Civil War will start on 4/12/2011, only that the “charts” of both periods of time imply that from 4/12/2011 to 12/21/2012 that time and patterns of an American Civil War appear to be repeating themselves. Looking at the Civil War which started on, 4/12/1861, to the 12/21/2012 date, and then on, 4/12/2011 to 12/21/2012, here’s what the charts revealed. They have the exact same pattern! One is over a period of 151 years, while the shorter time pattern only takes in 20 months (1 year & 8 months). If another American Civil War is what FEMA and Homeland Security fear by their preparations of massive purchases of food, water, and other provisions, then the TimeWave Charts appear to confirm that they may indeed be getting ready for another Civil War in America! The massive preparation now underway is not for the benefit of American citizens, but would be used to support a “defensive measure” against all who might rebel against any Federal or State Agency, local law enforcement officials, the military or National Guard Units, or Nationalized Police Force – the UNION of America’s Shadow Government controlled by the Illuminati forces. The building and stocking of massive underground survival cities and compounds under FEMA and Homeland Security is no more for the benefit of Americans than the TSA is for our personal safety. The development of FEMA camps, which Reagan signed into law as REX 84 while in office as President, begins to make a lot of sense under this scenario. Does Homeland Security know that food, water, and oil and gas shortages are close-at-hand to the extent that people will revolt against all forms of authority when the “trigger event” – be it food, water, lack of power,war, earthquake, or financial collapse of the economy and the Federal Reserve Notes – takes place? The first American Civil War will pale in comparison to the one on the horizon! In the first War it was brother against brother, but in the next one it will be neighbor against neighbor as well, and everyone against all authority of the Illuminati regardless of what banner they might fall under! In other words, a “community blood bath” from coast to coast! One only has to look at Egypt and Libya to see what might soon well occur in America. Russia has been preparing massive underground bunkers for the survival of their population in event of a Nuclear War or other event, while America has no such program for its population, but has built these types of underground bunkers only for the Elite Illuminati, their families, and those under the direct control of the “powers-that-be”. All this is enough to make one question Reagan’s statement about the former Soviet Union being the “Evil Empire“! For many years the Prudential Insurance Company of America used a slogan entitled, “Own A Piece of The Rock“, as a marketing tool to promote the company’s products and services. 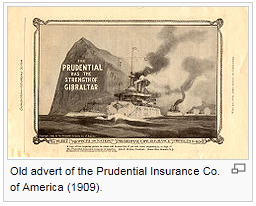 The slogan implied to the buying public that by having their insurance with Prudential, that they would automatically become entitled to the same financial “strength and power” that the company itself possessed and the image of the Rock of Gibraltar implied. In short, the “mantle of power” which Prudential represented in the insurance and financial world. Fast forwarding to the year 2011, you can own a different kind of “mantle of power” to promote the “conservative movement” while openly displaying that “mantle” for everyone to witness! Now available for purchase is your very own personal e-mail address which does not end with @yahoo.com, @google.com, @hotmail.com, etc. Your new e-mail address will be “yourname@Reagan.com“! The opportunity is not to “Own A Piece of The Rock” as the Prudential slogan suggested, but to own your very own part of the “Reagan Mantle“! 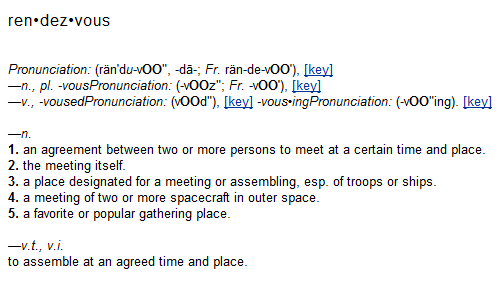 While you might believe that you fully understand the meaning of the above phrase, a little review of the definition of the words, “rendezvous and destiny”, can’t help but to enlighten our “mind and spirit” of the full depth and ramifications implied by these words. The number, 222, is the number of HELL in the Sumerian Code, and a zero added is simply the number being multiplied to the 10th power and again implied things eternal! 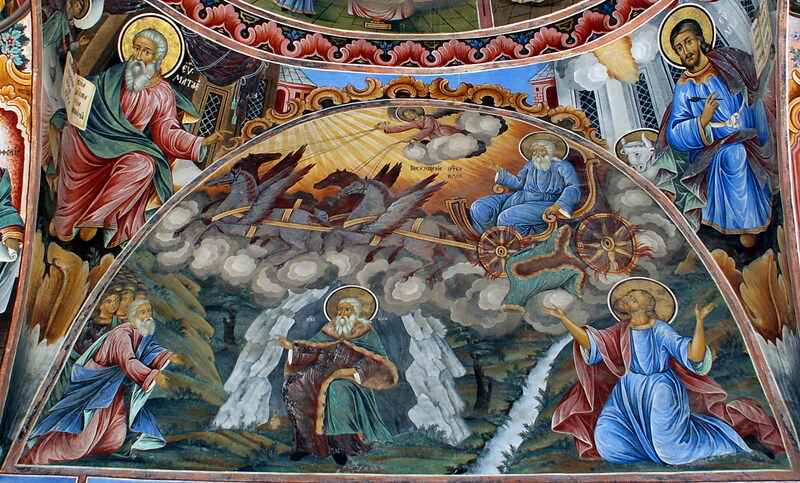 Is the very “incarnation of the “spirit and power” of HELL (the bottomless pit) being portrayed here? Think of the Osiris/Adonis/Horus “rising ceremony” being conducted when Reagan was the very first U. S. President to take the Oath of Office while facing the Phallus of Osiris; and Reagan is the very last U. S. President to “lie in state” who did so. This means that Ronald Wilson Reagan is the only person who performed both of these ceremonies – the first while alive, and the second ceremony after death. In short, Reagan is the only “spiritual entity“, according to the ceremonies and what they represent , to be in the position to be “raised by the sure grip of the lion’s paw” as the Egyptian/Illuminati/Masonic beliefs teach! As we already pointed out in an earlier article, Reagan was dubbed the “20th Century Adonis” while attending college! For review, see the articles: The Lost Symbol Decoded and Adonis Rising 2012. Does Sarah Palin already have the “Reagan Mantle” as this article seems to imply, or is she only chasing it as are many others on the political scene? You might find the full article to be of interest in making your decision on the point the author of the article makes. 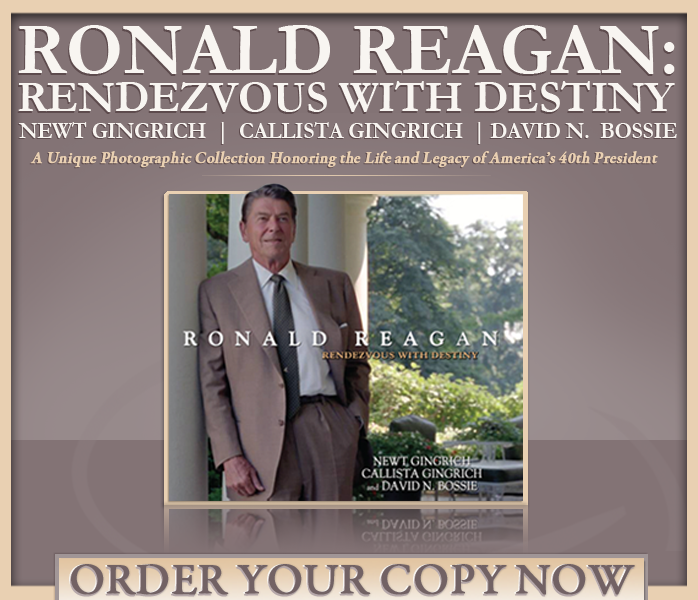 Palin makes it very clear in her book and in her speech, that Ronald Reagan is her Hero and her Idol! 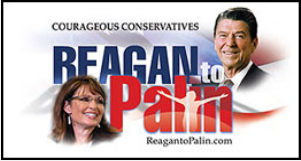 Here’s another site that offers a comparison of Reagan to Palin, and implies that by supporting Sarah Palin for President, that we are in effect getting a “reincarnated Reagan” in a female form. You can purchase bumper stickers, T-shirts, etc. at this site in support of the “Reagan Mantle” being brought forward and continued by promoting Sarah Palin for U. S. President! Sarah Palin gave the keynote address on February 4th, 2011, at the Reagan Ranch Center in Santa Barbara, California. Here’s a couple of her remarks with the reminder of the article found at the link below. This article from The Patriot Post speaks of the “Reagan Mantle” and what, in their opinion, it would take to obtain it in today’s world. Note that in the following quote, Reagan was a member of the 323rd Cavalry. 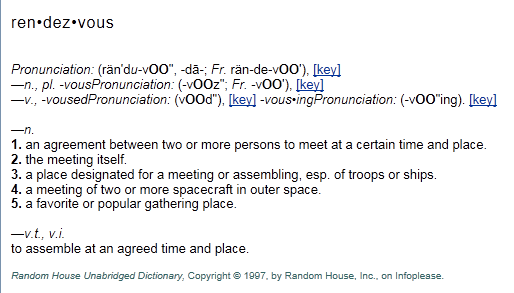 There’s the number 33 again within the number, and the number 2 is associated with witness. 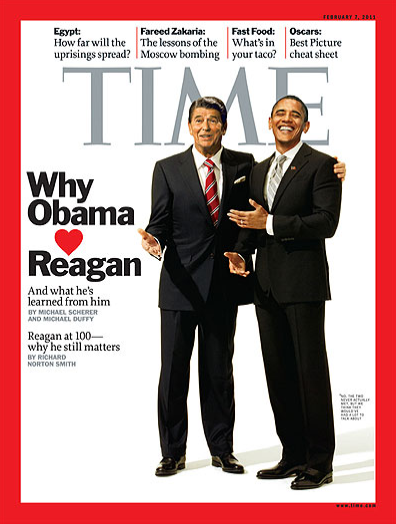 As we have already seen in a previous article, Time Magazine’s February 7th, 2011, issue has Obama and Reagan on the front cover. Even B. O. is attempting to capture the “Reagan Mantle” with talk of “loving the Gipper“, and his declaration for the Ronald Reagan Centennial Commission. Reagan’s former employer, General Electric (GE), also jumps on-board the two-year Reagan Celebration event in full-force. In case it’s not obvious to the reader, this is a “first” for any U. S. President! Why has Ronald Reagan been singled out for this honor and a two-year celebration commemorating the event , while all the previous 39 U. S. Presidents were not so honored? We’ve had other former Presidents who have reached age 100 while in their grave. Why were these former Presidents overlooked, while Reagan has been made into a “Mantle of Power” both the Left and the Right are seeking to capture? As pointed out in Part VI of The Lucifer Project – Raising Antichrist, after leaving office Ronald Reagan retired to his ranch at, 666 St. Cloud Road, but the “number was changed” to protect the …………. of the number! You fill in the blank! Here’s another mention of that event taking place. We’ve already seen that Ronald Reagan moved to 666 St. Cloud Road (changed to 668 prior to his occupying the residence) after leaving office as President. The location did not change, so it was still physically 666 St. Cloud Road when he moved in. The street number change only “covered” or “concealed” the real address as is often done in the Occult (hidden) world. What about the other ranch Reagan owned, loved, and at which he cut fire wood, etc. while taking breaks (vacations) from the Oval Office? It has now become a monument and training ground for Reagan’s portrayed beliefs and convictions about America and Government. Satan was never a man, he was never in a grave to be cast out of, and he was not in charge of a land (country) in which he destroyed his people! Nevertheless, Lucifer will have done all these things and much more! This is clearly speaking of an earthly ruler in contrast to other earthly rulers who are already in the grave BEFORE the death of this man called Lucifer! It is evident to me from the Scriptures, that Satan is not Lucifer! Lucifer will be the coming “creation of flesh” that will become the Anti-Christ and be incarnated by Satan himself! When Satan enters into this entity of flesh he will then become the object of worship that has been his goal from the beginning – to be worshiped as God! The “rebirth” of the Son of Perdition is at hand! 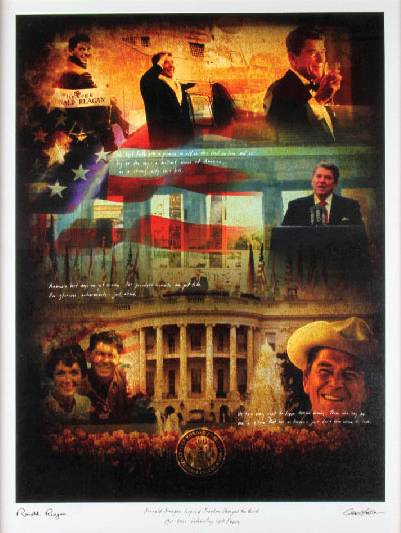 A “Centennial Celebration 100 Year” print is available direct from the Ronald Reagan Museum Store in celebration of the 100th Celebration of Reagan’s 100th birthday. While we’ve been touching on the “Mantle of Power” somewhat already in this article, we are just now getting to the point where it can be fully revealed for all its meaning and the ramifications thereof. To begin the “unveiling” of the mystery surrounding the “Reagan Mantle“, we need to look first at the Biblical teaching and outcome when a “mantle” was passed to another. While I do not support all the teachings of the “Church of God”, nevertheless, the article referenced above in “answerbag.com is one of the best I’ve seen covering the issue as addressed from a Biblical viewpoint. Jesus promised all “born-again” believers in Him that they would receive His “Mantle” (power and authority) after he left them and returned to the Father. There is no greater “mantle” for anyone to receive than what the Lord Jesus Christ described below. There is a counterfeit mantle of power and authority that is given by Satan to Anti-Christ and his followers which will deceive everyone who has not received the “mantle of Christ” via the new birth. 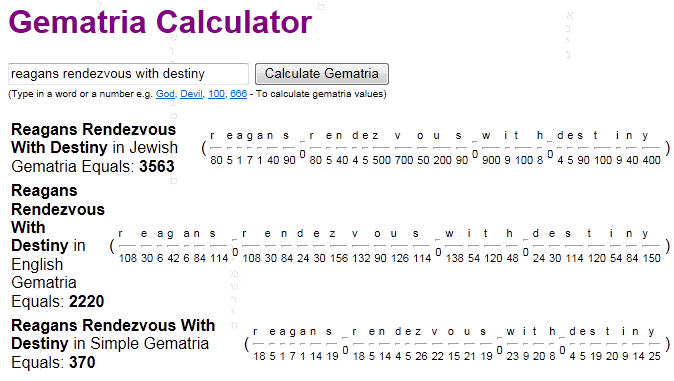 The above gematria of the “Reagan Mantle” reveals a complete picture in the life of Ronald Wilson Reagan. 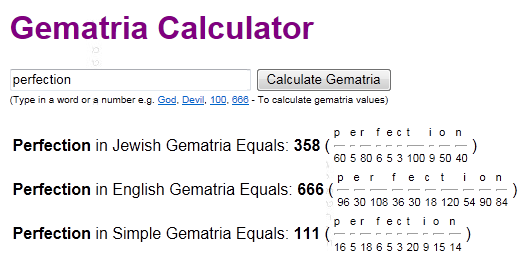 First, in the number 330 is found the number 33, Reagan’s favorite number and a number frequently associated with his life; and 330 is the number of Satan in English gematria (Sumerian Code). Secondly, the number 666 needs little explanation as to it being the “Mark of the Beast”, but it was also the number of letters in the name – RONALD WILSON REAGAN, six letters in each of his names for a 666 composite. The final number of 111 was the number of Reagan’s street address at his place of birth which is now a museum, and is also representative of the unholy trinity and the New World Order (1110) to be established under the “Mantle of the Anti-Christ”! While much can yet be said about all of the above, anyone who wishes to understand the ramifications and connections to the number 33, 666, 1110, etc. should read in its entirety, THE LUCIFER PROJECT – RAISING ANTICHRIST and all other articles associated with it. Dutch Sheets/Chuck Pierce prophesied that all would “begin and end” in Alaska. Sarah’s “code name” is “North Star.” I believe that the Great Pyramid will (or has already) aligned several marks (or openings?) on it with the “North Star” which is supposed to mean we’re in a time period marked by the ancients. (Here we go with GATES again!) A female prophet in Alaska prophesied that Sarah was “opening the northern GATES” – which I understand to be the “Northern Army” – satan and his coharts. The “GATES” are known to be where evil enters and/or where God sends punishment to those worshipping false idols. William Branham prophesied that there would be a woman president or vice-president that would be beautiful, but very evil. Another pastor prophesied that this woman may not be the President – but, would be the “power broker” even though appearing to be second in the Whitehouse. I don’t see America getting to the next Presidency, January 2013 – how Sarah would come into control of the White House is a mystery at this point in time. Newt (by the way) became a Catholic several years ago. I heard him announce it himself I believe on “Meet the Press.” I had always thought he was one of few that ever made any sense – UNTIL I heard him say he had become a Catholic (just like Tony Blair). Times are getting very interesting. Good article – thanks for all your hard work. You have provided some very interesting information to be considered in the overall scheme of things, both political and spiritual. Christians need to have their eyes “wide-open” and not be lulled asleep by the massive deception coming upon the world in this hour! Thank you watchman. Once again, your messages cause me to bow in prayer and supplication for my mostly unsaved family. I forward these articles, and sections of them (to intice the recipient to read the whole thing), whenever I can. God continue to bless you with wisdom and courage. I seem to remember she has some serious Masonic ties. Cannot recall where I read it, but may have been Gary Kah’s newsletter a long time ago when she was running with McCain. keep up the excellent work , I read few blog posts on this internet site and I think that your web site is real interesting and has got sets of great info . Greetings in the Lord, Watchman33. I have felt I should come back, and re-read the Reagan articles you wrote a few years ago. I am grateful they are still here. Blessings in Christ, you and your family. You are on my prayer list for Watchmen. Would you please give me the link to your Lucifer project mentioned above? I am searching your site, but getting a bit lost.